Easi-Set Precast Concrete Restrooms and Buildings install in hours and last for decades. They are cost-effective, proven winners for parks and recreation applications. Customizable for any purpose or style: restrooms, concessions, storage, dugouts, press boxes, hazmat, utilities, pump houses, security stations and more. Minimal site preparation, chosen for their security, versatility, longevity and low maintenance. Sizes from 8 by 8 feet to 50 by 250 feet. No water? No sewer? No problem! The Clivus Multrum M54 Trailhead is an odorless composting toilet system with ADA accessible bathroom structure. Ideal for remote locations, the Trailhead structure is available in single- or double-stall configurations and a variety of finishes. And like all Clivus systems, the Trailhead is odorless and does not pollute. With 40 years of experience, Public Restroom Company offers you buildings that are technologically superior, architecturally flexible, odor-free, with built-in proprietary vandal-resistant components and guaranteed for five years. The Public Restroom Company team never stops thinking about better ways to design, build and deliver restrooms, spray park equipment buildings, showers, concessions and other related buildings. This Conestoga Log Cabins 20-by-42-foot restroom features six identical rooms with space for toilet, washbasin and shower. This cabin bathhouse includes a separate ADA bathroom and a laundry room. There is a 6-by-42-foot covered porch on both sides of the building. The engineered logs ensure low maintenance and durability. Conestoga has installed log structures in more than 300 campgrounds and resorts. They will create customized plans to fit any budget and will assemble nationwide. Flush restrooms are now more affordable than ever. 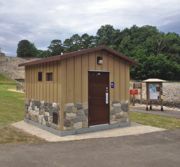 People have always preferred restrooms with flush toilets and sinks, but parks have had difficulty providing them due to the necessity and high cost of utility connections. Green Flush Technologies has engineered a solution to this problem with the invention of a permanent, totally self-contained flush restroom.